The VC7 is a multi-standard integrated converter. With motion compensation algorithms, fast changing images (like sporting events) appear crystal clear. Simultaneous frame rate and video resolution conversions are supported. With an optional board installed, the VC7 will convert 3D signals (either Side-by-Side or L + R) and different dual signals separately to any of the formats. Input audio channels may be remapped to any other channel location on the output. The VC7 also supports Dolby-E with the optional board installed. The time codes, user specified labels, and audio channel information may all be viewed on the output monitor. Motion compensation algorithms are used when the frame rate is changed and input video is converted smoothly. The frame rate conversion of 3D signals is synchronized on either Side-by-Side or L + R signal types. With the optional board installed, two separate signals may be converted simultaneously with one VC7 unit. Any audio input channel may be mapped to any audio output channel. 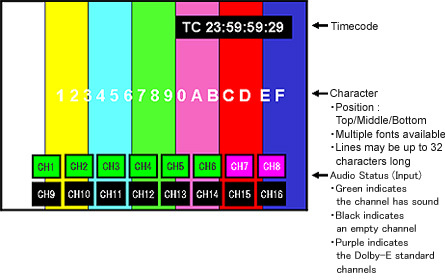 When the frame frequency is converted, time-codes are converted, newly added, or registered time-code is inserted. They are selectable. User Labels: Labels up to 32 characters may be assigned to specific regions. Audio Channel Information: The status of each audio channel can be displayed at any time. Input signal formats are automatically recognized and a pre-selected conversion type is automatically selected. With the optional board installed, Dolby-E encode and decode is supported. AFD on the incoming signal is automatically detemined, and the output aspect ratio may be modified to 4:3, 13:9, 14:9, 15:9, or 16:9. When a scene change occurs, the motion compensation algorithms are automatically disabled while the new scene begins. 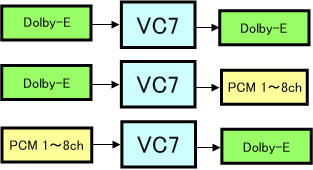 The VC7 can convert from / to the CEA608 and CEA708 standards. Copyright(C) ASACA Corporation. All rights reserved.